Here in this post, I would like to give you some scrapbooking layout ideas, and more specifically how to decorate your layout edges once you have finished if you find that your layout is missing something. Let’s concentrate on what we can do to decorate the edges of your layouts or even the edges of the mats of your photographs. These are often overlooked areas on your page, but sometimes a fancy edging can add some magic to the overall appeal of your scrapbooking layout. You could subtly frame something, draw attention to something, or simply add decoration by using these techniques. If you need entire layouts, you may well be interested in this book that can be purchased online. To find out more simply click on the link or on the picture. 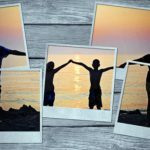 If you’re feeling overwhelmed with stacks of photos or stuck in a scrapbooking rut, look no further for answers and inspiration! The Big Book of Scrapbook Pages will help you find the creative spark and new scrapbooking layout ideas for your projects. 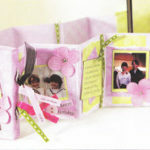 Punching is one of those great scrapbooking layout ideas and a great way of decorating the edges of your page. There are many different types of punches available, and some of them are specially designed with alignment guides to help you to create an even and continuous pattern or border around your pages. Most punches do have a limited reach, so this limitation makes them ideal for creating borders for your pages. When using a continuous punch with a repeated design, keep the pattern continuous on your page by aligning part of the punch pattern with the holes already punched on your layout. You can try practicing this on some scrap paper first. Repeat this process until the entire border area is punched. Specialty border punches usually remove a strip of paper from the edge as the motif is punched. Scissors with shaped blades are an excellent investment for your scrapbooking kit, and they come in many designs. Using these scissors is a quick method of decorating the edges of your pages or photo mats. When using the scissors, open them fully to cut, but do not close the blades completely, then realign the pattern on the shaped blades and cut again until the entire edge is cut. Tearing is a great way to quickly add some character to your scrapbooking layout while decorating the edge of your scrapbooking page or even the edge of the matting around your photos. This is one of my favorite scrapbooking layout ideas, and I use the tearing technique pretty often. It can look quite dramatic if a colored card is used with a white core that shows through when torn. Practice the tearing technique first, as the direction of the paper grain will influence the way that the paper tears. If you need a straight tear, tear against a ruler. Lay the ruler 1cm from the existing edge of the page and hold it firmly while you tear short sections at a time. On thicker paper, you could try tearing with water. Lay your steel ruler down 1cm from the existing edge and dip a fine tip artists brush into clean water. Paint a line of water along the edge of the ruler, and make the paper quite wet so that the water soaks through to the back. Gently tear the paper along the wet line pulling the edge away sideways. Tear short sections at a time and pull any fibers out of the paper as you work. There are various different methods that you can use to add some color or definition to decorate the edges of your pages. You can use color on torn, punched or straight edges for a subtle or bold finish or frame. One of the easiest ways is with chalks or an ink pad. Using an ink pad is a clean and neat way to color an edge. You can buy the ink pads in many different colors, and you can even get metallic and glitter ones. The sponge applicator makes it easy to achieve lovely soft and blended shades. You could also use a makeup sponge to gently stroke the color down the edges of the page. Use the color sparingly by dabbing a little at a time. You can always add more if you want it bolder, but you won’t be able to remove the ink once it is on the page. Chalks will give a more pastel effect, and you will be able to easily apply these by rubbing them into the page as you would eyeshadow, with the sponges supplied or a spare eyeshadow sponge. Another way to add color to decorate the edges of your layout is with a colored or watercolor pencil. Just lay the edge of the page on some scrap paper and color along the edges. Colour should be deeper at the edge and then fade into a lighter shade further in onto the paper. If using a watercolor pencil brush over the color with a paintbrush and add some water to soften and blend the color. A sewing machine is a great way to generate more scrapbooking layout ideas. Try using it without any thread to create very pretty decorative edges. Most of the sewing machines out there have a variety of built-in embroidery stitches. The only drawback with this technique is that the sewing needles dull more quickly than they do when using on material. Set your sewing machine to the required stitch, but don’t thread it. Lay the paper under the pressure foot with the edge of the paper on the foot. Try to keep your edges aligned against the food while sewing to keep the design running in a straight line. Set the stitches far apart, or the strip of paper will simply tear away. Explore the different stitches your sewing machine can produce and experiment with altering the stitch length and width. This technique for decorating your edges is fun as it is so creative. This time you do thread your machine with thread, and using the same technique as perforating you sew with a contrasting colored thread. For added interest, try using metallic or multicolored thread to subtly change shades as you sew along. As you can see there are loads of ways in which you can decorate your scrapbook edges with just a little imagination. Here are some more scrapbooking ideas. Go wild and let me know if you come up with some more great scrapbooking layout ideas by commenting below. 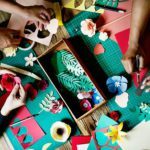 Free Ideas Scrapbooking Enthusiasts Will Love! I love scrap booking and you have given so many ideas here. One thing I had not considered was decorating the edges of the pages! What a great idea 🙂 I had also not thought about using the sewing machine. I have recently moved across the United States, and left my sewing machine behind. I am really starting to miss it and thinking I am gonna have to get another one! I went without a sewing machine for ten years, but now that I have bought another one, I don’t know how I ever did without it. It is always fun in decorating and making designs in our scrapbooks and I am really glad that I found this article. This article had everything I needed to know about layout ideas for my scrap book. It is a well-written article and it was easy to understand. Thanks for making time for this lovely comment Sujandar.